Friends? Traditional roles have been completely thrown out the window in our home. As a kid, my mom stayed home with us until I was in the 6th grade. Even then she was still home mostly. She not only raised three kids, but I can’t ever remember our house being a disaster area or having toys strewn about or having crumbs all over the floor. Unless dad was in charge. Fast forward to today, Saturday, December 18, 2010. It is my first day of winter break. The first day of a lovely 2-week long stretch. In my mind? We are all happy and family-ish together since I am always gone. We cuddle and play and eat and just enjoy each other without too much commitment elsewhere. you guys? today? did not happen like that. First of all, our kitchen faucet died yesterday, so this morning, Cort has everything out from under the sink spread all over the island, the table, and the counters. He also has pulled out the old faucet, and he is off to Lowe’s for the new parts. In case you didn’t know? Cort can do anything. He is all Handy Manny up in here. Has he ever done any plumbing before? No. But he is all awesome at it anyway. Because that is how he rolls. So I am in charge of our Short Stack while daddy is gone. In the course of the hour that daddy is gone…. Eddie rolls 3 different toy vehicles across the coffee table and into our Christmas tree exploding needles from here to Florida. Eddie takes a giant dump. Eddie takes his Golden Graham snack and spreads it all over the floor announcing that his bowl is ‘aww unnn” (all gone). riiiiiggght. I decide to give Eddie left over penne noodles and sauce for lunch. Eddie decides to throw penne noodles and sauce at the floor, the cat, the wall, the blinds, the table, and finally in his mouth. I have to clean Eddie off by standing him on the counter…where all the “treasures” from under the sink still are…which he REALLY wants to explore while I scrub red sauce out from under his pits. I change his diaper again because the outside is covered in red sauce that while tasty? Does not match my house. Just as I have Eddie cleaned up and dressed, Cort comes back in. The scene? It looks like a pine tree that was snacking on golden grahams was murdered by noodle-pelting. Eddie is all happy and playing and watching Sesame Street on Tivo. I? I am standing there with dirty wipes in my hands…waving them as white flags. Seriously? What the hell just happened? WHAT? How does he deal with it? He patiently puts down his Lowe’s purchases, takes the wipes, and directs me to sit down. He then proceeds to clean up the crime scene high chair/kitchen area while I sit and ponder where I lost my “mom patience”. I go to work, I bring home the paycheck, I make some dinners once in a while, and I cuddle the boy when he is sick, scared, or hurt. I have often wondered why, if he is home all day, is the house not smelling of bleach and lysol when I get home. One small little man can reek havoc on a small house in the time it takes to go blow my nose. This is so my life, in reverse. I stay at home (still don’t have patience though) and my husband watches the kids for part of the day and then the house ends up in chaos as a result! Too funny. It’s like they know they have the other parent for a few hours so they want to put you through your paces too. Maybe someday we’ll make the mess and the kids will clean it up. Here’s hoping. Eddie likes to help “pick up”, but not CLEAN–obviously. I can handle toys everywhere, but it’s the poopy pantses and flinging food that cause me to want to run for the hills! The part about waving the wipes as white flag? I have that most days, too. It is never ending but it is rewarding! 🙂 It definitely takes some getting used to. And E and my B would seriously destroy a house in a matter of minutes. I just know it. Let’s never leave them alone…or we are dead meat! Hahahahaha! I can’t help but laugh! There are some days where I would like someone else to be the “mom” and stay home and deal with the messes! Yep, that all sounds about right. Being a SAHM is no picnic. If you ever did it, you’d learn tricks to make your life easier! I am sure…but I think those who can do it are awesome. Eddie and I are too much alike, which doesn’t help. so true! love this. honestly though, if you had to (or decided to) you could do it… and you would get used to it… and even be good at it. It definitely took me awhile to get the hang of being home and enjoying it. love your perspective – crack up! That about sums it up! I am a SAHM. Just recently dh found out what it was like when I ran Christmas shopping for only 4 hours. The house was trashed tons of dishes, bottles and diapers on the coffee table. Then he wonders why I pass out on the couch every night.. I am nodding my head all the way through this post. It is SO familiar. This is pretty much my life. Well my child is 12, no longer wearing diapers and in school… but he’s Autistic & ADHD and some days I feel like it takes me most the time he’s at school to recover from the morning and several hours at night to recover from after school. My husband who travels and gets elected to industry board positions does NOT get it. He keeps trying to manage me like he manages his people. I still get caught in that picturing the idyllic family trap & kissing the hurts & cuddling is the bestest part! THANK YOU for making me feel normal! you are welcome! and I tip my hat to you, lady! Way to do a HARD job! And I am sure you do it well! I think the ONLY way I can handle “stay at home” and not go completely insane is because my hubby is also “stay at home”. Those that do it alone (and on a daily basis) are heroic! I mean that hour that you described is like a nightmare. A nightmare that is still successful because your child.. he is happy, and happy is wonderful!! Even when it’s both of us home, Cort takes the lead role with Ed. I think Eddie and I are way to similar. We are fine to play together, but when discipline needs to happen, Cort is just better. Ed and I both have hot tempers and are stubborn! Ha! Thank you for recognizing exactly what the stay at home parents go through. It’s not that we wouldn’t LIKE for the house to be scrubbed top to bottom and always sparkling for visitors, but most days it takes every thing we have just to keep the bare minimum completed. This is even harder for me, because I am a HORRIBLE housewife and will use any little excuse I can find to cuddle my daughter or just play rather than do various chores. It seems like the working parents just don’t get it until they finally have stretches of time at home, and even then, it doesn’t get felt at our house, because my daughter is so excited when Daddy is home to play that she’s even more angelic than she is normally. I totally get what SAHMs go through! I think anyone who can do that is amazing. AMAZING. Of course we would all love the cuddles and the playing AND a sparkling lovely house…who wouldn’t? But I now know that is completely out of the question…for now. Being with the little guy is way more important that dusting, ya know? Thanks for the comment, too, by the way! Rock on with your SAHM self! Props to you! As a childless working woman, this made me laugh out loud…like hysterically! yeah, i figured you would like this motherly image of me. you’re welcome. Some days I am completely baffled on how Shawn can handle the worst days without even breaking a sweat on his brow. I suppose that us moms are more on duty more than they are and that they can handle a bad situation when it arises. I do give stay at home moms so much cred but at the same time I wish I could stay home. LOL! I could relate, but like a few others have said, I’m Cort in our scenario. Although I have to say I don’t always have patience. It is frigging TOUGH to be home w/a baby, now toddler all day long every day. And even when my hubby is home, I’m still the one who handles everything. There are days I think I will go crazy. But then I imagine what our life would be like if I was working, and that scenario is way scarier to me. 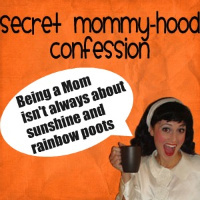 You are absolutely write about the SAHM thing not being for everyone. It isn’t. And I think a woman has to recognize that and know what is best for her. Because that is going to be what is best for her family.